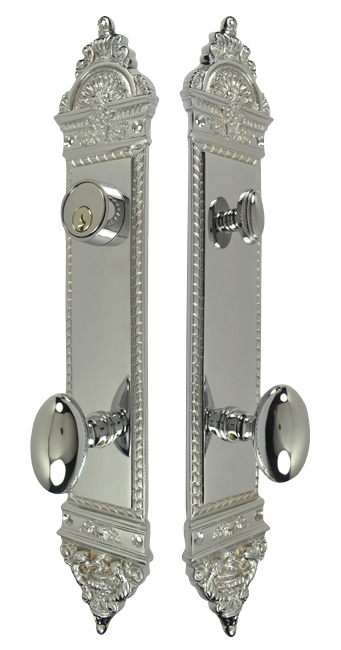 L'Enfant Style Single Door Deadbolt Entryway Set (Polished Chrome Finish) - The solid brass plate measures 3 inches by 16 1/4 inches. Made for a 2 3/8 Inch Backset (2 3/4 Inch Backset also available). Entry set deadbolt to knob center-to-center distance is 5 1/2 inches. Comes with tubular latch mechanism, strike plates, complete knob sets, internal mechanisms, deadbolts and complete mounting hardware.